Our private dining room is open! Set in the subterranean basement of Halloumi Southside, we’ve created an intimate room that’s perfect for parties, dinners, business meetings or whatever you’d like, really. There is even a well-stocked bar and a cool sound system for you to enjoy. It’s complimentary to hire for all guest and friends of Halloumi, which means you. So, if you’re looking to host your next event in Glasgow, do it in Halloumi and make it one to remember! Email south@halloumiglasgow.co.uk to explore how we can make it happen. Private Dining, Catch Up with Friends or a Boozy Lunch? 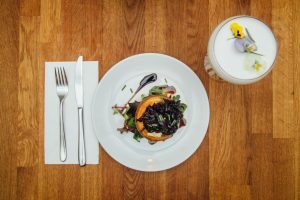 The room is perfect for private dining in Glasgow and hosts 22 seated in the comfortable surroundings of a Mediterranean-inspired decor, with postcard blue accents and lush green foliage around the room. Ask for a tour, next time you stop by! Strawberry cocktails and a BIG sharing menu, what’s not to love? Valentine’s Day is the day to show the one you love that you care. 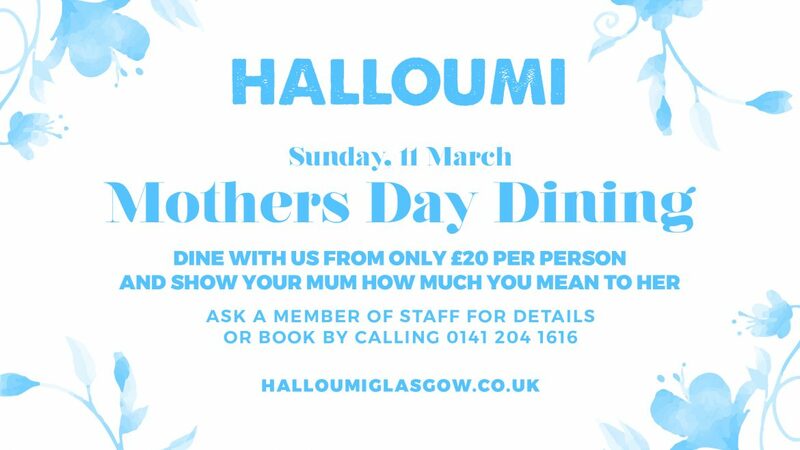 So whether you want a day out with the girls or lads, or lunch with bae, join us in Halloumi for a Valentines to crush over. On special, we’ll be serving up our Strawberry Saint. Made with Larios Rose gin, it tastes like a strawberry refresher and also available as a mocktail. Beautiful with our meze. Psst, don’t have a broken heart on Valentines. We’re already looking busy at both locations so if you’re planning on joining us we recommend booking your table to avoid disappointment. 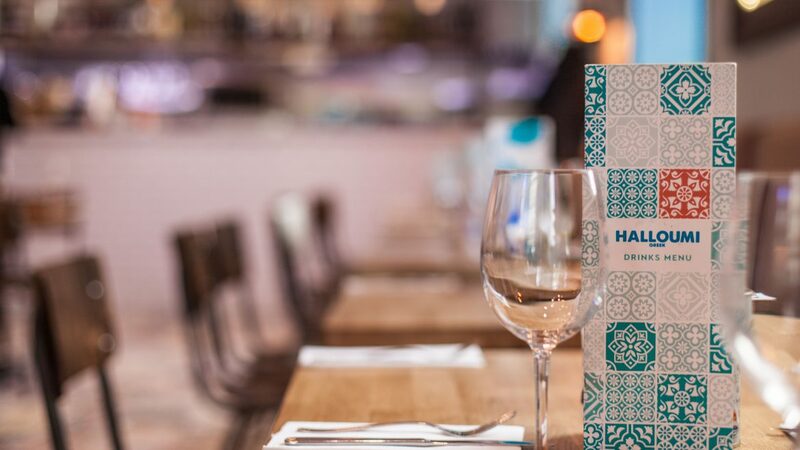 Indulge in a taste of the Mediterranean this festive season and join us in Halloumi in Glasgow! We’ve got so much on offer that this Christmas season will be one to remember for all the right reasons. Feeling festive? Try our festive menus, priced at £24.95 they are sure to tempt your taste buds, and if you’ve not tried one of our boozy hot chocolates yet, you’d be mad to miss them. From cool mint to irresistible orange and hazelnut flavours, there’s a taste for everyone. 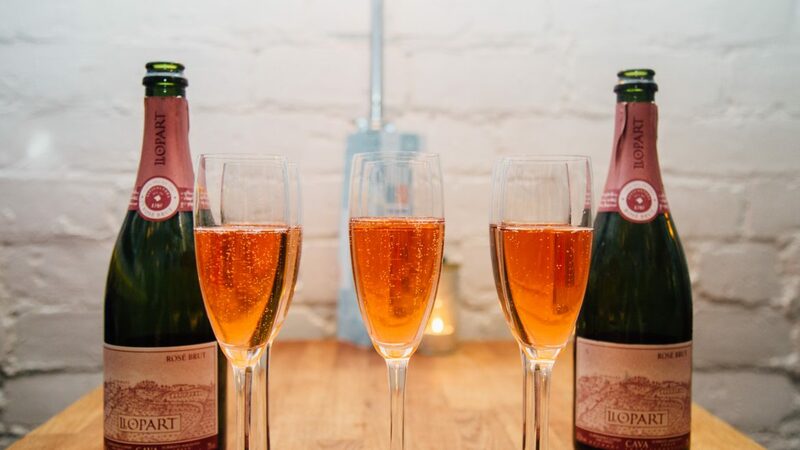 Or if you’d rather drink fizz every day, mark your diaries as our winter bubbles starts on Boxing Day for a fortnight of fizzy affordable madness. Yamas!! Not booked yet for our Christmas menu? December is already looking incredibly busy at both venues, so if you’re planning on joining us we strongly advise reserving your table to avoid disappointment. 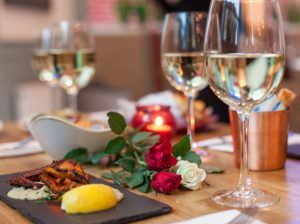 Whether you fancy a taste of the Mediterranean in the south side or in the city centre, booking could not be simpler, just log on to our website and choose which venue you’d like to dine or drink at and we’ll take care of the rest. 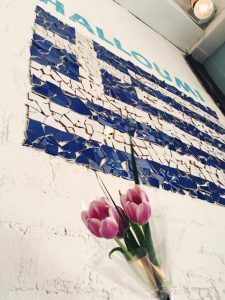 Get yourself to the Greek – Halloumi Southside is open and looking FAB-U-LOUS! Our new taverna is open! Inhabiting a former bank, our new Pollokshaws road location boasts a private dining room, event space, bespoke bar area and large open plan 80 cover restaurant. 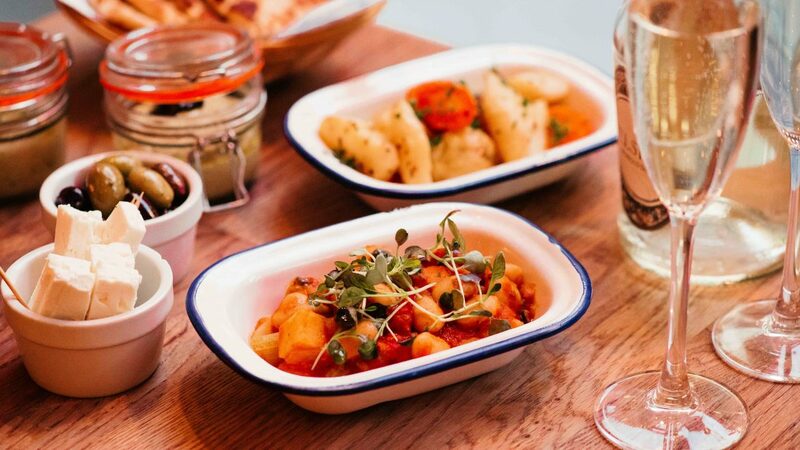 Brought to you by Glasgow entrepreneurs, Toni Carbajosa and Kevin Campbell of The Rotunda Group, Halloumi in the Southside follows on the huge success of its Hope Street location, which opened in 2016 with their much loved ‘small plates, big flavours’ ethos. Serving up a modern taste of the Mediterranean, the new restaurant and bar will offer small plates with traditional slow-cooked stews, delicately marinated meat skewers and tasty Greek flatbread kebabs; gyros, all on the menu. Expect mouthwatering souvlaki, and vegetable Dolmades, a traditional Hellenic dish served in fresh vine leaves. 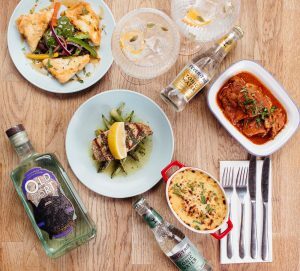 At the bar, as well as an impressive selection of Scottish drinks they will host Hellenic craft beer, Mediterranean wine and artisan Greek gin. 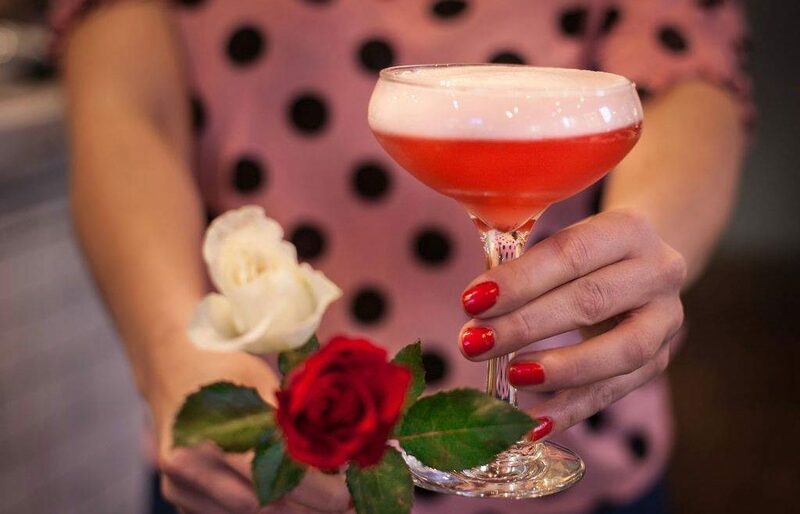 While some of their dazzling cocktails are named after Greek mythology, other crowd-pleasing creations are inspired by the breath-taking scenery of Athens – think wild blooming flowers; both perfectly Instagram-able and sure to please. Following our strong stance on limiting plastic usage, sustainability is at the heart of the build, with reclaimed wood, furnishings and energy efficient fittings all being put in place to create a comfortable dining and drinking experience for guests. 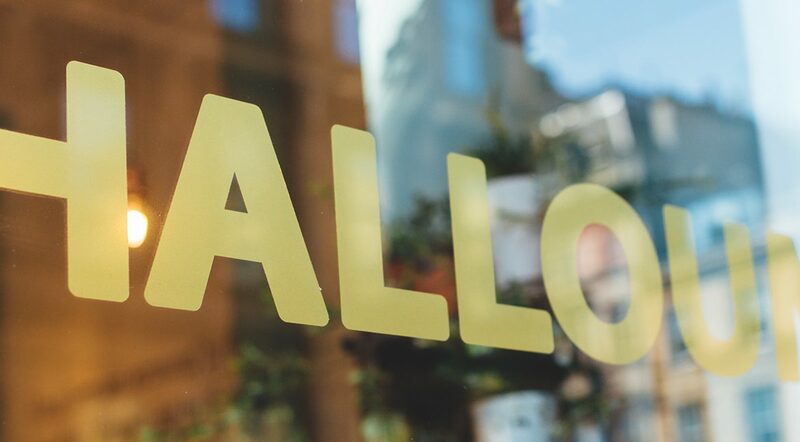 “We’ve been searching for a second Halloumi location for a number of months and when we saw this venue we immediately fell in love with the building. It’s a beautiful setting for a restaurant and our team are being very careful to restore and repurpose. 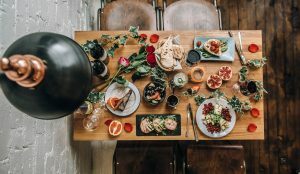 We can still taste summer but for all those of you asking about Christmas, we will be offering a tasty gift for all you early birds that organise your festive party, family gathering or the big Christmas night out. Parties of six or more dining with us in December will receive a £40 gift voucher to spend in January at Halloumi. Want yours? Just book and pay your deposit of £5pp before October 31st and leave the rest to us. Don’t be left disappointed. Email Lapreet to book your table and enjoy our £40 gift to you.